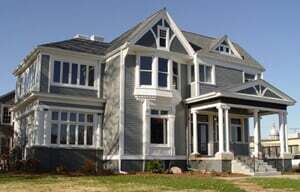 The home that is now our office was built in 1883 for Sarah Bunn Jones and her husband, Attorney Frank Hatch Jones. Sarah Bunn Jones was the third of six children of Illinois industrial pioneer, Jacob Bunn (1814-1897) and his wife, Ada Richardson Bunn. In 1892 Sarah Bunn Jones left this home to care for her widowed and ailing father. This home then became the residence of George W. Bunn, the fifth child of Jacob Bunn and Ada Richardson Bunn. George W. Bunn served as President and Chairman of Springfield Marine Bank, President of Bunn Capital Grocery Company, and as a member of the Board of Directors of Illinois Watch Company. In addition to his many business pursuits, George W. Bunn was a gifted athlete, winning the Illini Country Club golf championship four straight years between 1912 and 1915. Since 1836 the Bunn family has provided high quality employment opportunities for Springfield residents. Bunn family businesses have included the J. Bunn Grocery Company, Springfield Marine Bank, Illinois Watch Company, Springfield Iron Company, and Sangamo Electric Company. The family is perhaps now best known for the popular Bunn commercial and residential coffee brewers. 1001 South Sixth Street is the only surviving home in Springfield from the first generation Bunn family. In 1948 this home was purchased by John Edward Sankey and his wife, Kate Chatterton Sankey. Kate Chatterton Sankey was the great granddaughter of George Chatterton who owned Chatterton's jewelry store on the Springfield city square and sold Abraham Lincoln his engagement ring for Mary Todd Lincoln. Mr. John Sankey owned and operated Sankey Brothers road construction business for many years. John Sankey continued to own and live in the house until his death in 1982.